The World Health Organization estimates that nearly 100% of mental health needs of people living in Africa are unmet. I found this astonishing and it led me to researching a series of books, 'Where There is No Psychiatrist' and 'Where There is No Child Psychiatrist'. While in the process of developing the content and trajectory of my PhD work, I felt inspired by these community driven initiatives to treat mental illness in the absence of psychiatric expertise. The WHO developed the Mental Health Gap Action Program (mhGAP), an initiative that explains basic treatment principles, to non-experts in developing countries and hard-to-reach populations. Our project first started by programming the paper-pencil version of the mhGAP into an easy to use, free to download, app. It quickly became apparent that there was still a large gap in access to assessment and treatment for children and teens. 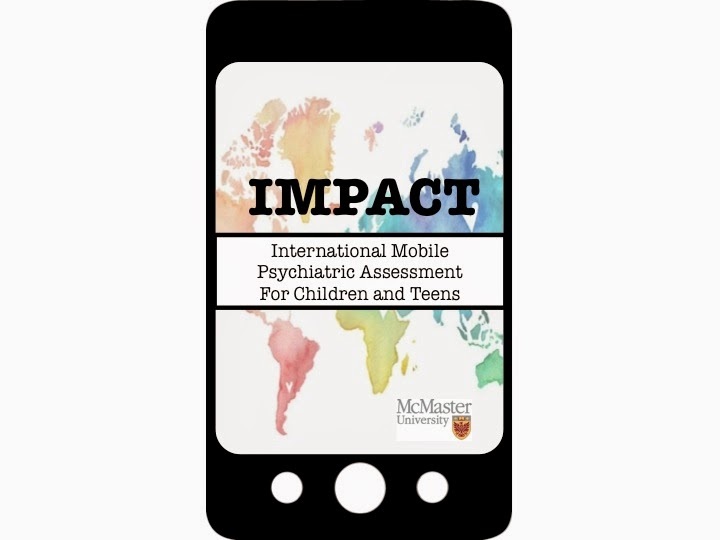 In response to this concern, we have developed International Mobile Psychiatric Assessment for Children and Teens (IMPACT). The IMPACT is a comprehensive, diagnostic psychiatric interview app for kids. The interview works on standard mobile phones and tablets and is intended for use in hard-to-reach geographic regions, and areas where limited psychiatric expertise is available. Next year, the McMaster IMPACT team will be travelling to Kenya, where we will pilot the assessment in collaboration with child psychiatrist, Dr. Ndetei, from the University of Nairobi and African Mental Health Foundation. If you are interested in the IMPACT, please click the contact tab.